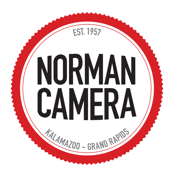 The Norman Camera Photolab app lets you easily upload photos and order prints from your device or from the ones you have stored at www.normancamera.com. Choose to pick up your prints from either our Kalamazoo or Grand Rapids, Michigan location or have your order shipped! - Upload and order photos on the go! - Print in a glossy or matte finish. - Choose from a variety of print sizes.